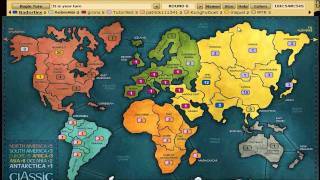 Watch this 5 minutes instructional video explaining the Major Command Risk game interface design. Meet the basic features and lot to take in. So, enjoy watching or read the video transcription below. 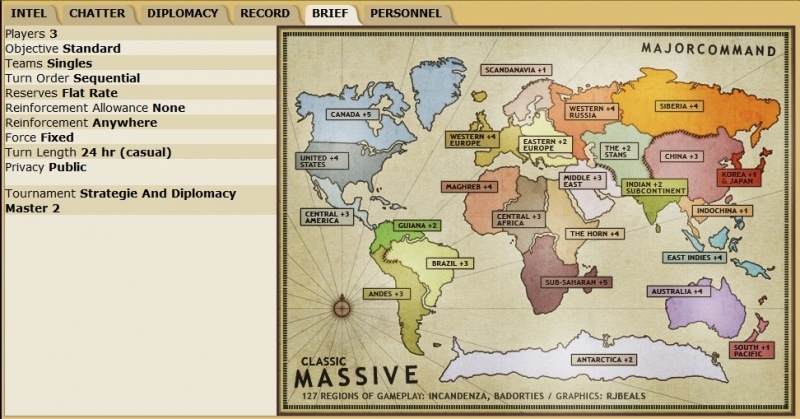 Feel free to address any questions in connection with any Major Command Risk strategy games. What’s up, people? Badorties here. I’m going to run down the features of the interface. There’s a lot to cover so I’ll try and get to it pretty briskly. First, this is called the action button. You begin your turn, you end your turn, you get to the different phases by clicking that. The person’s turn it is, will be underlined. This is a list of players in the order that they will play. Badorties goes and then RobinAlbi has been eliminated, that’s why there’s a slash-through the name. After I will go Grons and then Tutor965, and then Patrick111341, et cetera. If I mouse over a player’s name, it will highlight the regions they own which is good to get a quick sense of where they are on the map. These round buttons, you might not use too much, but if you wanted to go back and see what the game state looked in previous rounds, you would do that. Clicking the “Names” button here will turn the names of all the regions on or off. You can keep them off if you don’t need them, but sometimes you want to refer to a region and you’re not sure what it is, so you click that names button there. The “Size” will obviously change the size of your map. Some people like it smaller, some people like it bigger. There are three sizes. This is the biggest size right here. “Help” button will display some help text if you need it. The “Colors” is kind of cool. You can change your color. Let’s say I want to be orange. You can also change everyone else’s color like I’m going to change this person to pastel or something like that. Just keep in mind that everyone has their own set of colors. So, I can’t refer to Grons as purple because he might not be purple himself or Tutor965 might have him as red or something like that. This is just kind of helpful. I always set myself to black. It’s just so I know who I am. That’s just my preference. Another trick is that sometimes I’ll set neutrals to clear or if there’s a guy that I want to specifically target and I want to make sure that I get all of him, I’ll set him to red. So, I’ll make sure that I can see all of him really quickly. That’s the top screen. This is the timer. It says 18 hours left. This is obviously a casual game. Back down here are several tabs which are also going to be used pretty frequently. “Intel,” you kind of always want to be checking this to see who’s in the lead in terms of troops, how many reserves, et cetera. These are people’s ranks which are some of the good to watch out for. RobinAlbi is a cadet, so eliminated first. High-ranking people, you want to watch out for as well as Patrick111341 who is on Kitchen Patrol. You don’t want to be eliminated by him either. You want to keep track of how many troops are due. I see MTR has seven on his next turn. That’s pretty big. The “Chatter” is where people can chat. Just say, “Hello.” “Good luck.” Or anything like that. It will show it by rounds so you know how recent this was. “Diplomacy” is a feature which you should probably read a little bit more in-depth on, but you can basically make an agreement between two borders not to attack each other. Let’s say, with RobinAlbi – let’s see where I’m at up here. I’m blue so I’m in The Stans and maybe I’ll make an agreement with China who is Tutor965. What I’m going to do is I’m going go to Tutor965. I’m going to click The Stans and China, and I will say make an agreement for three rounds. That doesn’t mean we can’t attack each other but if we do, that’s not good form. It’s going to lower our diplomacy rating, et cetera. Generally you try and keep diplomacy requests. He has to agree to this in order to go into effect. There’re a lot more nuance things about diplomacy, but that’s the short of it right there. The “Record” will show all of the actions taken by all of the players, so that’s something to check back every now and then. The “Brief” will show more information about the map, the bonuses and all the [world’s] [ph] variants going on right here. You definitely want to keep that in mind just to make sure you know what the reinforcement allowance is, et cetera. The “Personnel” tab is where you can mark players as honorable or dishonorable. If someone screws me over or he’s rude in the chat, I might mark them dishonorable or some of these players I played a lot with, so they’re pretty honorable. I like them and I’ll mark them as such. Those are the basic features at Major Command Risk game interface and lot to take in. So, good luck gaming.